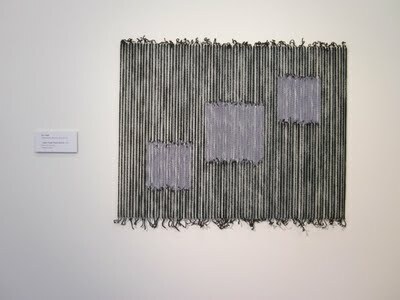 Ahn Wells’ recently exhibited work in the group exhibition POINT OF ENTRY at the Front Room Gallery,Newcastle is titled 3 Dusty Purple Woolie Squares (2011). 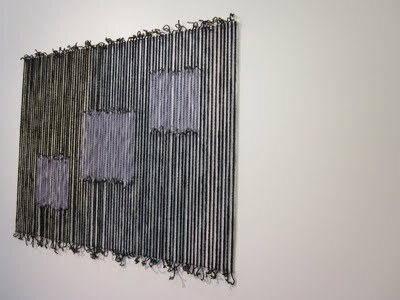 It is a frameless rectangle of 60cm x 80cm, comprised of regularly spaced vertical strands of black, crocheted woollen yarn into which have been knotted three fifteen centimetre, dusty purple squares, rising diagonally from the lower left. Despite its simplicity of design and construction this work is far more evocative and engaging than its sparse title may suggest. Each strand is nailed one centimetre from the wall and a similar distance from its neighbour. This spacing produces the physical depth which allows the uniform grey shadows cast by the crocheted strands to become an integral part of the piece, in a relationship that constantly shifts as one moves in front of it. The interplay between the strands and with these shadows creates the dynamism generated from within this deceptively simple work. Open, seemingly vibrating strands transform into solid corrugated surfaces, only to be released back to their former state in the next glance, seducing the viewer in an engaging, hypnotic dance.